Polish painter, graphic artists, photographer, and art critic; representative of the Constructivist movement in the 1920s and organic abstract art in the 1930s; creator of the heliographic technique. Born 1891 in Łódź, executed in the Lućmierz Forest near Łódź in December of 1939. Painter, graphic artist, photographer, and art critic. Between 1903 and 1910 Hiller attended the School of Craftsmanship and Industry in Łódź. From 1910 to 1912 he studied chemistry at the Higher Technical School in Darmstadt. He continued his studies between 1912 and 1916 in the Construction and Engineering Department of the Polytechnic Institute in Warsaw until he was drafted. After the war he found himself in Kiev, where he studied art at the Academy of Fine Arts under Mikhail Boychuk, a Byzantinesque painter. The research he did into old painting techniques proved useful when he began to use icon tempera in his own paintings. Hiller survived the October Revolution in Kiev remaining politically involved throughout. In 1921 he returned to and settled in Łódź, where he immediately became active as an artist, educator, propagator of the arts, and social activist. He was a co-founder of the Association of Visual Artists (Zrzeszenie Artystów Plastyków - 1931), a member of the Start group and the Professional Union of Polish Visual Artists (Zwiazek Zawodowy Polskich Artystów Plastyków - beginning in 1933). In 1928 Hiller exhibited at the Modernists' Salon in Warsaw; between 1930 and 1937 he participated in a series of exhibitions organized by the Institute of Art Propaganda in Łódź and Warsaw. In 1932 he showed his work alongside that of the New Generation / Nowa Generacja group at shows in Lviv and Łódź, and in 1933 Hiller exhibited with the Modern Visual Artists Group / Grupa Plastykow Nowoczesnych in Łódź. A solo exhibition of his works was hosted by Warsaw's Institute of Art Propaganda in 1938. 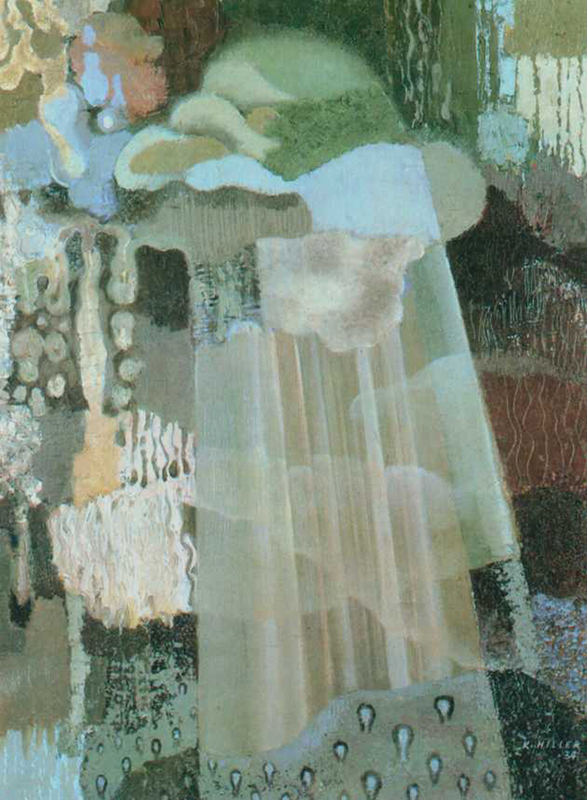 In 1967 the Museum of Art in Łódź mounted a retrospective of Hiller's oeuvre. The artist was also an art critic. Between 1933 and 1936 he was the editor of "Form" / "Forma" magazine, in which he published a series of theoretical articles. In 1934 Hiller won first prize in a competition for the design of an emblem for the city of Łódź together with Aleksander Rak. He was arrested in November of 1939 and subsequently murdered by the Gestapo. In 1946 the city of Łódź posthumously bestowed a visual arts award on Hiller for his achievements as an artist. In the early years of his artistic career Hiller painted realistic portraits with bright, intensive colors. The influence of Byzantine art is apparent in the works he executed in tempera while still in Kiev. Hiller's mature paintings dating from the late 1920s are dominated by modern, industrial cityscapes and the motif of the laborer at work. The artist juxtaposed human figures with various structural components. Influenced by Cubism, his forms were often geometric and he used planes and volumes to construct balanced, abstract arrangements with variegated textures (Kompozycja ze spiralą / Composition with Spiral, Kompozycja "O" / "O" Composition, both 1928). These include visible allusions to the cogs and mechanisms of factory machinery and engines - spinning wheels, motionless cylinders, and vertical pipes - and fragments of industrial architecture (Walce / Cylinders, 1938). The artist used a subdued palette in a restricted range of tones; he enriched his textures with impastos and grooves. During the 1920s he also painted religious works and still lifes with flowers. Hiller was clearly a pioneer in creating the heliographic technique. Devised in 1928, his method consisted of creating abstract compositions using tempera paints and gouaches on glass plates or celluloid film and printing the results on photographic paper. In some cases the artist engraved and scratched the base material and overlaid or rubbed paint into the resulting textures. In these works the artist juxtaposed hard forms with soft ones, artificial objects with organic forms, the monumental with the microscopic, large planes with minute fragments. He created strange constellations reminiscent of cosmic nebulae. In the 1930s he abandoned flat, Constructivist geometry to create abstract compositions with biological forms. Often akin in their poetry to Surrealism, these were filled with fluid, organic forms captured in motion (Kompozycja 205 A / Composition 205 A, 1932, Embrion / Embryo, 1933). Fascinated by the philosophy of Bergson, Hiller saturated manifestations of his imagination with "irrational elements" (Promień / Ray, 1933; Deszcz / Rain, 1934). In his figural paintings of the late 1930s his shapes exhibit the succinctness of signs (Robotnicy / Workers, 1938). Some of his later paintings acquired a symbolic and metaphorical dimension. Hiller also created a series of murals and stained glass windows, in addition to ex libris, linoleum-block prints, lithographs, posters, and photomontages. He illustrated numerous books and produced, among others, the cover for Ara Szternfeld's Initiation a la cosmonautique. He designed scenery for the stage and book covers for the "Renaissance" and L. Fiszer publishing houses in Łódź. Author: Irena Kossowska, Institute of Art of the Polish Academy of Science, December 2001.